There are a lot of things that children can learn on their own, but some things can only be passed on. The tell-tale sound of a ripe melon is learned from years of experience on the farm. The young boy, straining under the weight of the watermelon, is nevertheless confident that he will load his cargo safely onto the old truck. Likewise, the special way a Grandfather looks at his grandchildren teaches lessons in love that can only be harvested from the field of relationships. 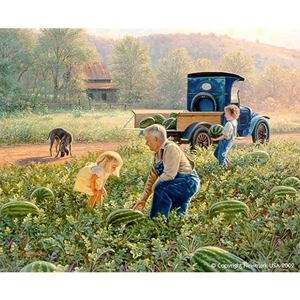 Lessons of life are evident in The Watermelon Patch.